Even the 918 Spyder may want to watch its back with this one. Porsche has finally come out of the closet during this year’s Goodwood Festival of Speed. After denying the existence of the 911 GT2 RS, a stupid move considering everyone knew it was coming, the automaker has finally peeled the wraps off of the hottest 911 to date at a private event on the Motor Circuit at the 2017 Goodwood Festival of Speed. Despite the lack of shock from the crowd, there was plenty of awe going around and for a good reason. First off is the fact that Porsche isn’t kidding when it says this is the most powerful 911 of all time. Sitting over the rear axle is a 3.8-liter twin-turbo flat-six engine from the current 911 Turbo S. While it "only" makes 580 horsepower in the Turbo S, Porsche adds larger turbochargers, a titanium exhaust, and a clever cooling system that sprays water into the intercooler to extract more horsepower out of the engine, giving it a total of 700 horses in the GT2 RS. The water tank for the cooling system is stored in the front trunk in part because the rear end is already saddled with plenty of responsibility. Not only does it cradle the engine and house a rear-axle steering system, but the rear tires are responsible for putting down 553 lb-ft of torque. Purists who decry Porsche for excluding a manual in favor of the seven-speed PDK transmission are missing the point because the GT2 RS isn’t built for fun. It’s a precision racing tool for the experts and if they just so happen to enjoy driving it fast, that’s a side effect Porsche can live with. To be fair, it’s tough not to have fun behind the wheel, especially when the GT2 RS can hit 60 mph from standstill in 2.7 seconds before topping out at 211 mph. It’d be idiotic to assume Porsche didn’t back that performance up with the best suspension and chassis hardware it has to offer. Included in the bundle is Porsche’s active suspension management and an electronic limited-slip differential for tidy cornering. To make all the tech worthwhile, Porsche installed meaty Ultra High Performance 21-inch tires on the drive wheels measuring 325/30 and 20-inch 265/35s on the front end to serve as the ambassadors between car and road. That plentiful sum of grip also lets the ceramic composite brakes installed on all four corners do their work more effectively when approaching apexes or walls. If that rear wing wasn’t a dead giveaway, aerodynamics are imperative to the function of the GT2 RS. Along with the large rear wing are air intakes and outlets, front wings, and wheel housing vents that turn the atmosphere into an ally. Equally important are the weight-saving tactics Porsche used. Helping to keep the GT2 RS at a respectable 3,241 pounds, even with fluid levels topped off, are fenders, wheel housing vents, mirror caps, and air intakes made of carbon fiber reinforced plastic while the hood is made solely of carbon fiber and the roof is derived from a slab of magnesium. The interior blends luxury and purpose, calling upon carbon bucket seats to save weight while colorful pieces of Alcantara and leather create a beautiful contrasting effect. Empty space is filled with a carbon weave finish while the Porsche Communication Management system sorts out all infotainment-related needs. Option include the Chrono Package as well as the expensive $31,000 Weissach package that shaves 40 pounds off of the GT2. It manages this by swapping the standard wheels for magnesium units, exchanges the magnesium roof for a carbon fiber unit, adds carbon fiber anti-roll bars and end links, and replaces the steel cage for a titanium unit for cars sold outside of the US (American GT2 RS cars don't get a cage). If the price of the Weissach package tells you anything, it’s that the GT2 RS is not for the financially unstable. 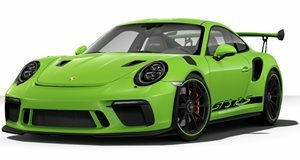 Expect to pay $293,200 for an example of your own, but at least there will be no added "finders fee" for the supercar flippers because A: Porsche hates that, and B: Porsche is not setting a production cap for the GT2 RS. Throw in that deposit if you want yours by the time the first cars are delivered in early 2018. Not like you need more evidence that the 911 GT2 RS is a badass sitting on four wheels, but you can see that for yourself courtesy of Porsche's action packed promotional video. Thankfully there's plenty of sound samples showing us what that 3.8-liter twin-turbo engine sounds like.